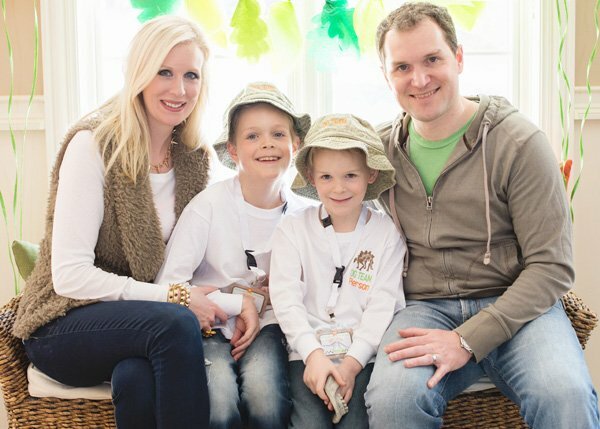 Maureen Anders of Anders Ruff here to share my son’s recent Dinosaur Dig Birthday Party! 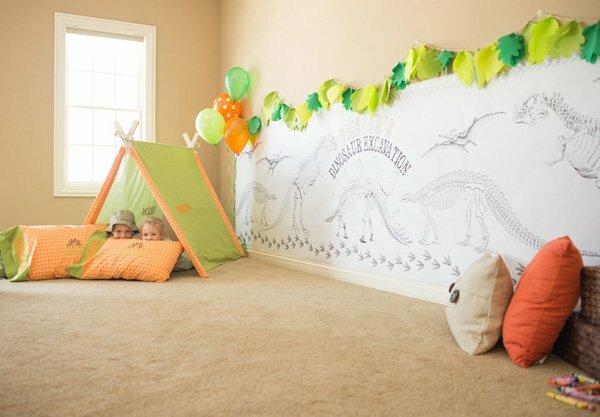 Natural elements combined with pops of orange and green helps make this popular dinosaur theme versatile for big or little kiddos. 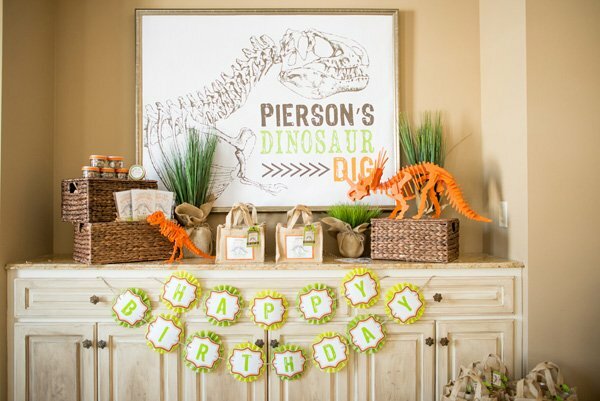 I hope you “dig” all of the dinosaur party decorating ideas and activities! 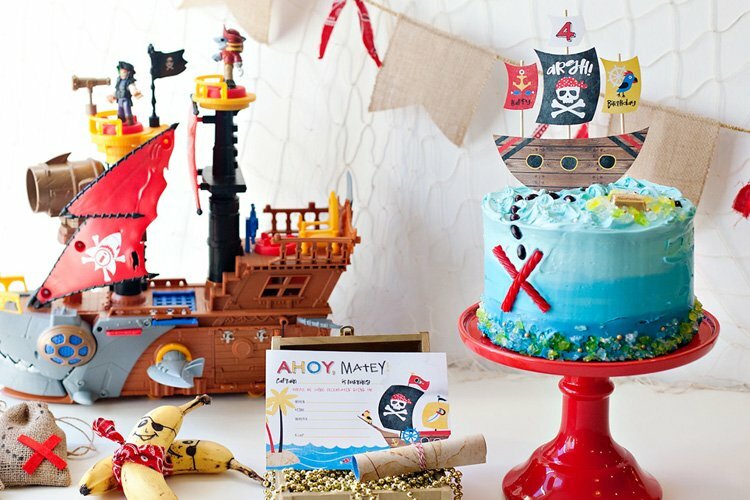 I am so excited to share my son’s recent 6th birthday party! 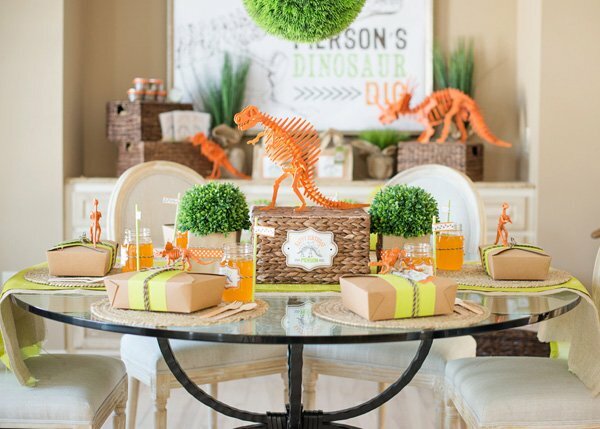 This year, Pierson decided that he wanted a Dinosaur birthday party. 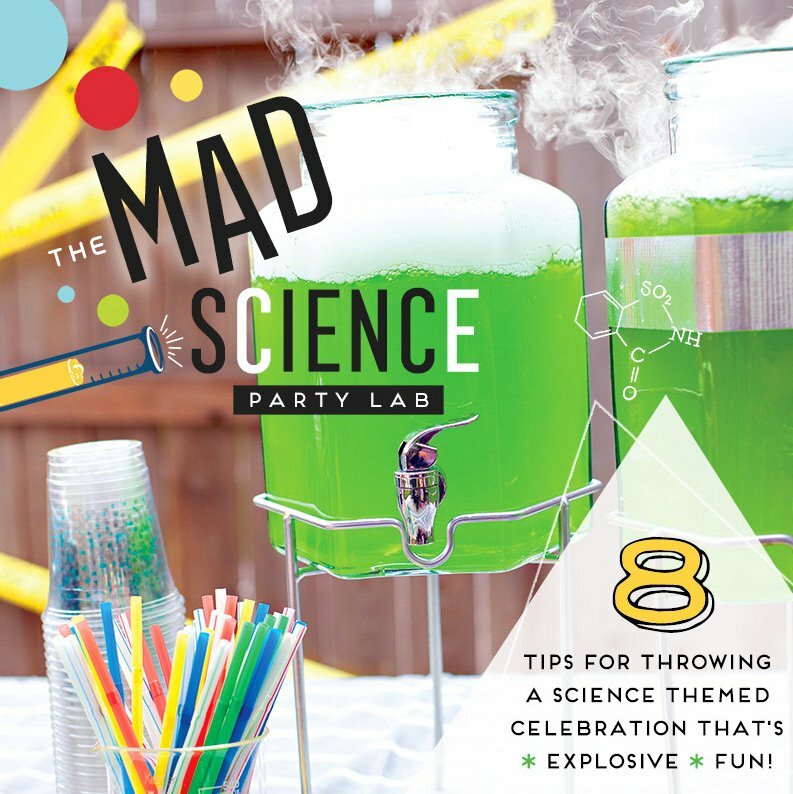 I have had some fun dinosaur party ideas brainstormed for a long time that I’ve been wanting to execute! Instead of a cartoon-ish dinosaur party, I wanted to create more of a classic museum look – a look that was appropriate for bigger boys (but one that could also work for younger ones). 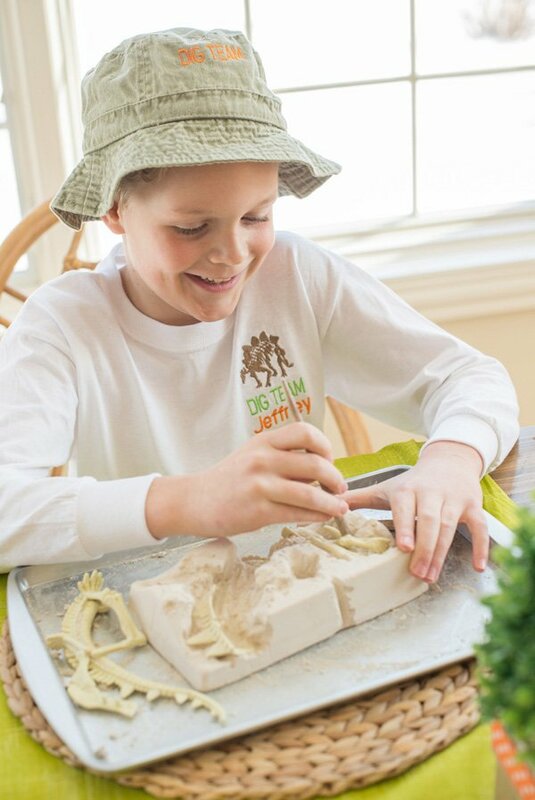 Pierson is curious about fossils and dinosaur skeletons and bones, so we decided celebrate with a Dinosaur Dig Birthday Party! 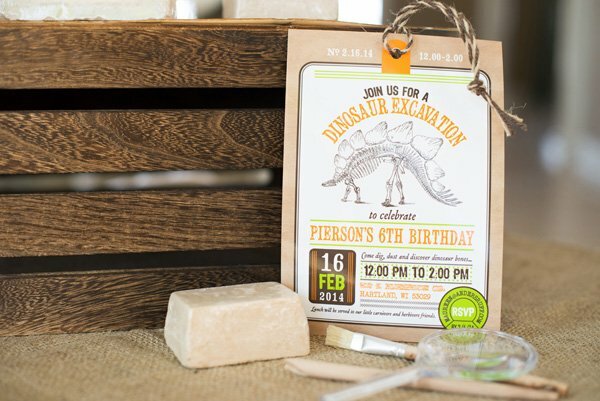 We sent out fun Dinosaur Dig Excavation Birthday Party Invitations to all of Pierson’s friends. 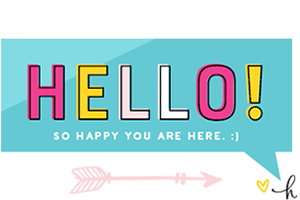 I love how the address wrap turned out (I’ll share that photo soon)! Michelle Kujawski, our contributing photographer of Michelle Kujawski Photography, did an amazing job capturing all of the elements from the party! 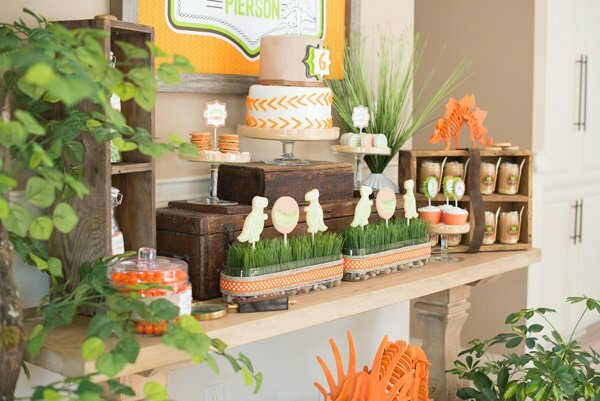 I incorporated rustic antiqued wood, greenery and pops of orange and green throughout the entire party. 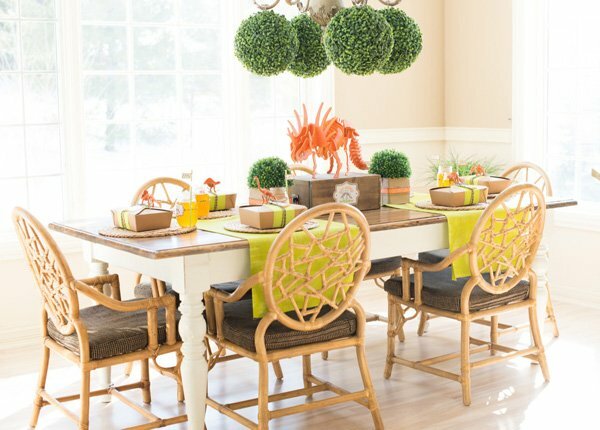 I love how the kids tables turned out, especially because I was so excited to find these greenery topiary balls to hang throughout! They felt so “dinosaur” but still party-ish (is that a word?) and added the natural green element! Above the tables were green hanging topiary balls and then on the table top, I placed small topiaries on either side of the centerpiece. 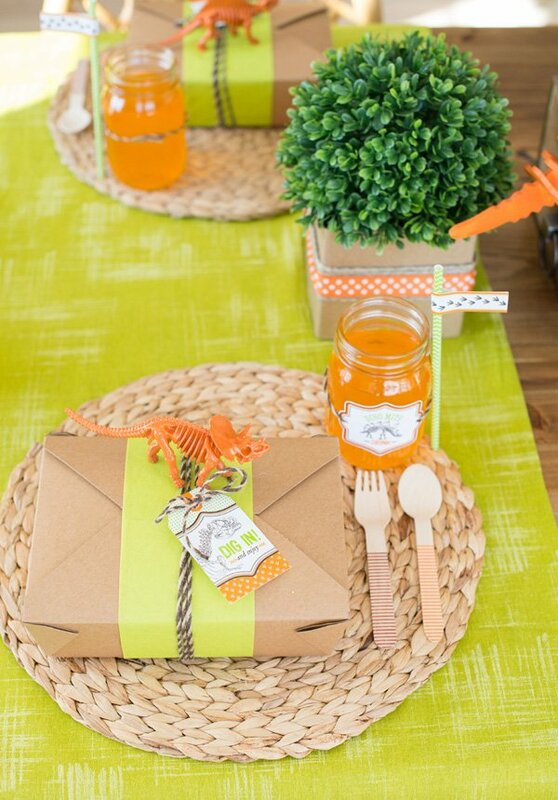 The table was lined with fabric runners in a bright green color. 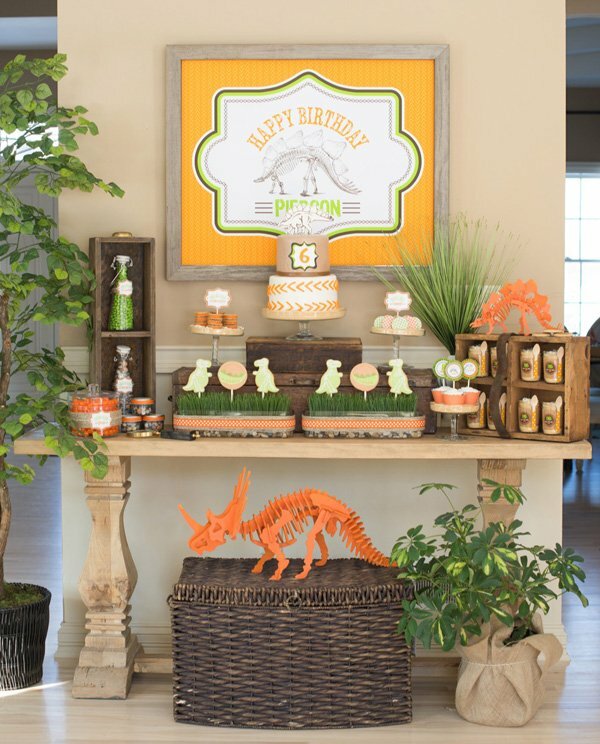 I mixed in the wooden decor as the centerpiece with the spray painted dinosaur for another pop of color. 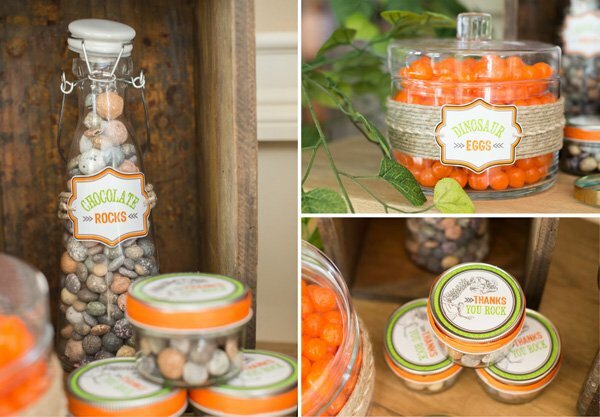 Dino Tracks Trail Mix (pretzels, candy rocks, sixlets, raisins) and was topped with our printable topper. A Turkey and Swiss sandwich (wrapped with butcher paper and labeled with a “Tasty Carnivore Bites” label from our dinosaur label set). We topped each box with a spray painted dinosaur (from Oriental Trading) They looked so cute! 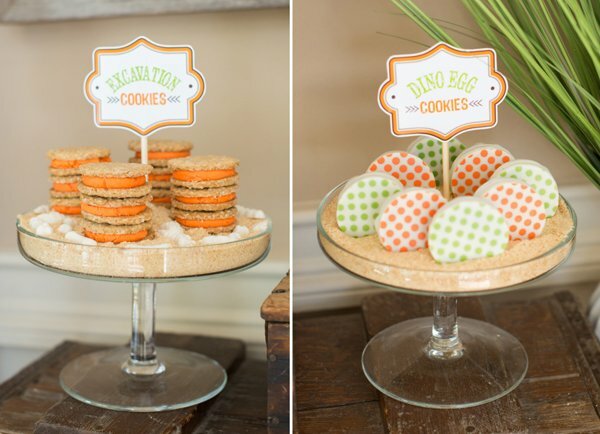 The hang tag from our printables said “Dig in and enjoy!” and finished it off so nicely. Sucre Shop sent us the cutest striped wooden utensils. 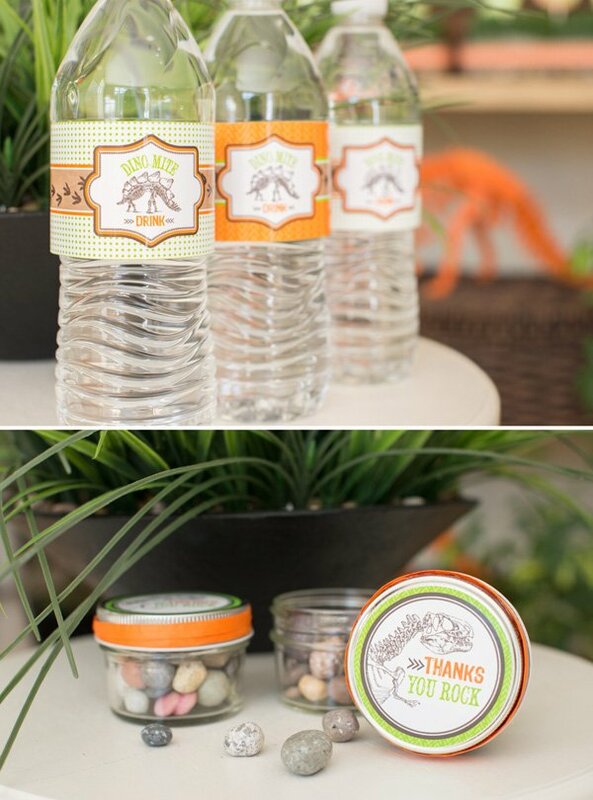 We embellished mason jars (from Oriental Trading) with printable “Dino-Mite Drink” labels from our printables in the shop. 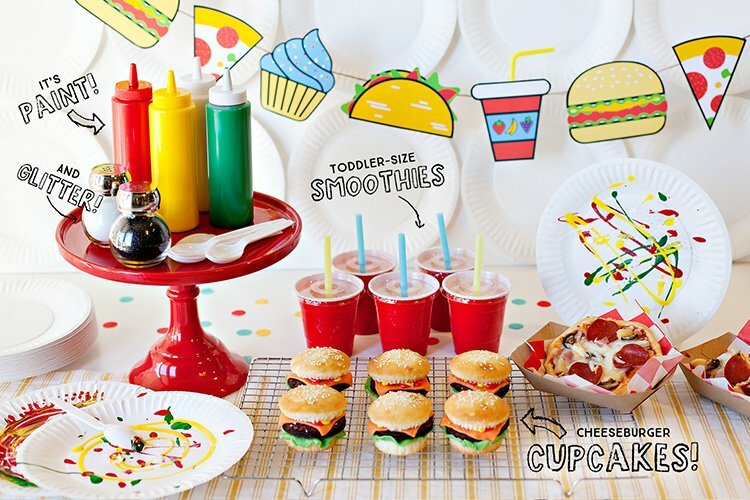 Straws (from Smash Cake Studio) were embellished with a printable party flag. 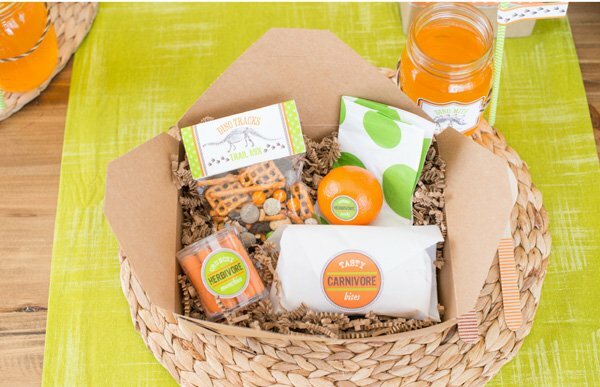 The kids enjoyed “digging in” and felt like the little lunch boxes were personalized and like opening a present of fun foods! It’z My Party Cakery in Milwaukee made the most adorable dinosaur cake for the dessert table! I displayed the cake on a glass cake stand that was filled with edible sand to go with the dinosaur dig theme (finely chopped graham cracker crumbs). By the way, the cake was just as yummy as it was beautiful! I incorporated various greenery plants throughout the table, along with antique wooden props and boxes for height and texture. 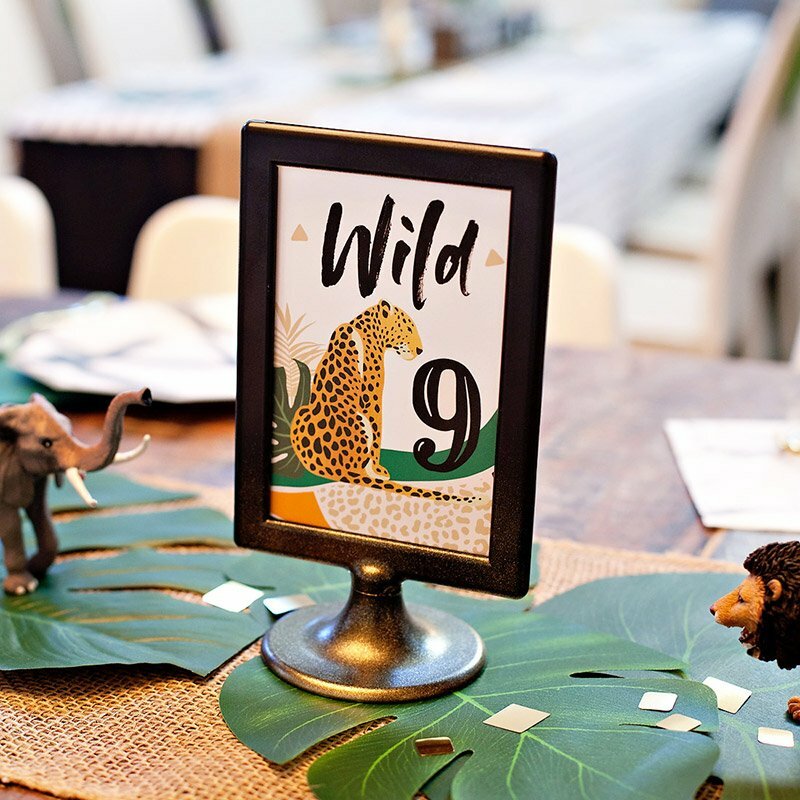 We framed a printed poster on the backdrop which added that customized element with lots of color and pattern from the dinosaur dig printable collection. Print My had fabulous printing for our printable posters and signs! I love the color! The quality is fantastic. I created fun Dinosaur Dig Excavation desserts by filling jars (from Specialty Bottle) with ground up graham crackers as the base, and then filling it with whipped pudding, and topping it with more graham cracker crumbs and topping it with white chocolate dinosaur bones that I made. 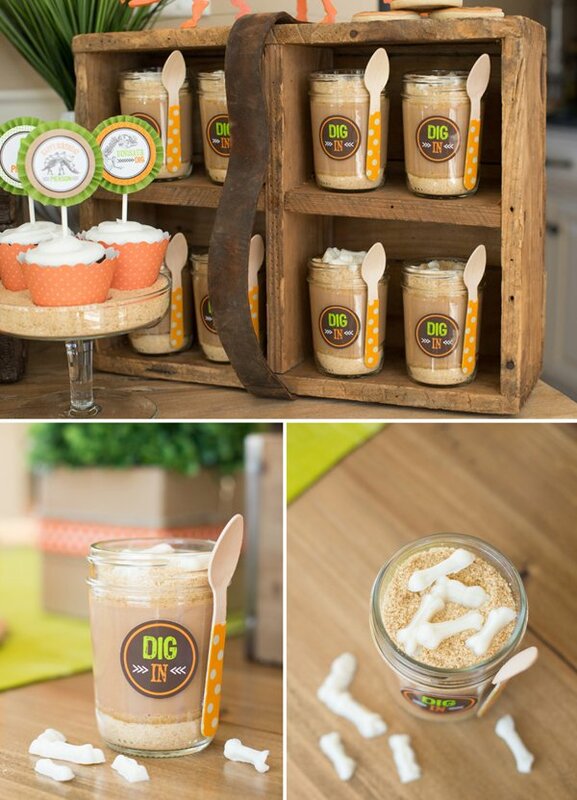 We adhered a wooden spoon (from Sucre Shop) to the side of the jar and embellished it with a printable “Dig in” label from our printable Dinosaur Dig Collection. I added dramatic decor into the table by creating these 3D Wooden Dinosaur Puzzles and spray painting them with orange spray paint. We also displayed cupcakes in glass cake stands filled with graham cracker crumb “sand” and placed them in cupcake wrappers from Bella Cupcake Couture. We topped them with ruffle matted printable party logos. Our sweet friend, Chana Wood, of Sugar Wood made these amazing orange icing filled Oatmeal Cream cookies. I loved how my white chocolate bones turned out in my bone mold, and so I displayed these cookies in graham cracker crumb “sand” and scattered the dino bones around. 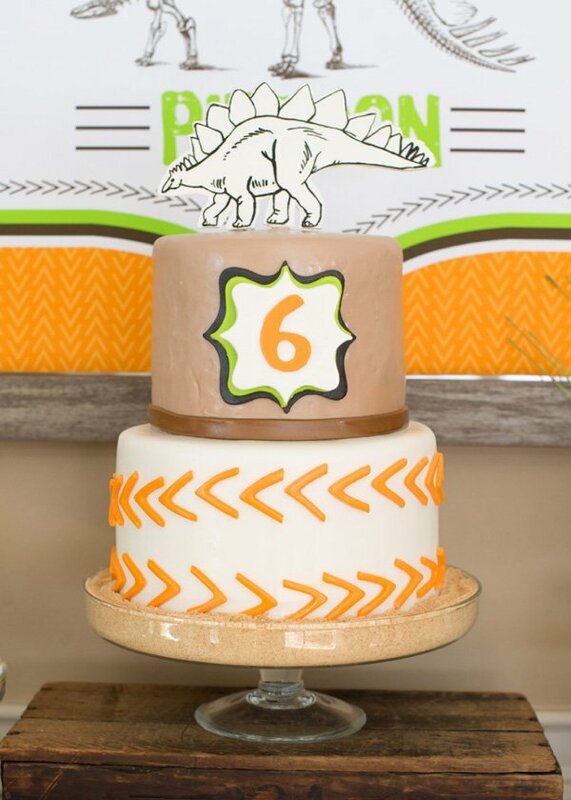 Tip: Even though some of my desserts were not dinosaur “themed,” it was easy to make them fit into the theme with techniques like the above! 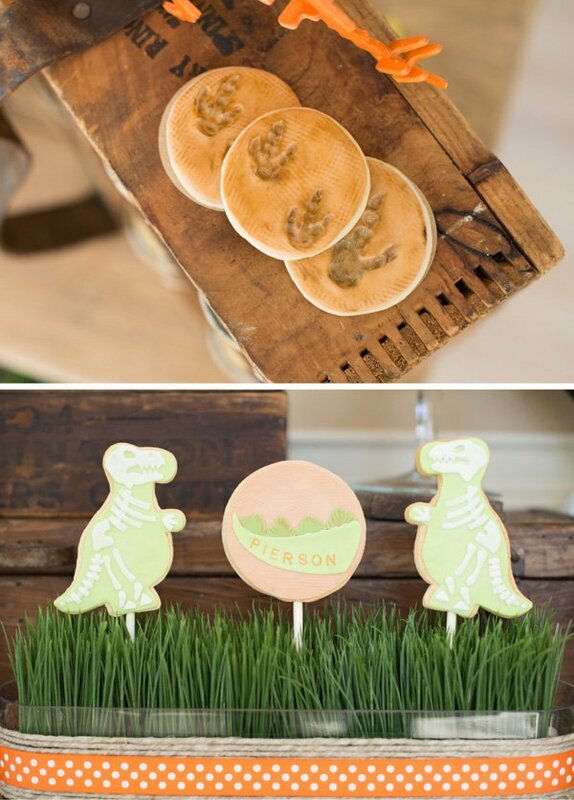 Frog Prince Cake & Cookie Design made these amazing fossil cookies and dinosaur cookie pops! Are they not perfect!? We loved sticking the dinosaur cookies out of a glass vessel with faux wheatgrass. It was perfect and the grass helped add texture to the table! Candy Galaxy has the best selection of candies and we loved showing off their orange sour balls and chocolate candy rocks. They were PERFECT! To bring in the natural element and make the glassware more rustic, we added twine around the glassware and customized it with a printable party label. When the kids arrived, they became true “dinosaur excavators” by getting dressed for the occasion. Brenda of Great Stitch made the most ADORABLE embroidered t-shirts and hats for the kids. Each child received the hat, shirt and an ID Badge customized with each kid’s name that we put in a lanyard from Oriental Trading. 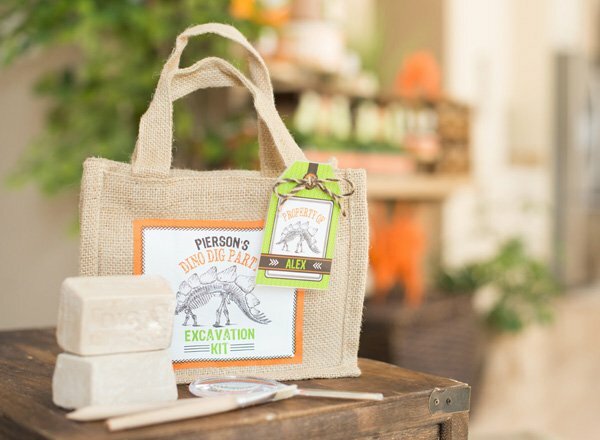 For the first activity, each child received a Dinosaur Excavation Kit that we made by ironing on our customized Dinosaur Dig Excavation kit design onto burlap totes from Nashville Wraps. We used onlinelabels.com opaque transfers for ironing on the labels. They turned out perfect! The bags each were labeled with a customized laminated luggage tag from our printable luggage tag set. Inside were several Dig Kits (from Oriental Trading) which included adorable digging sticks and brushes. We also included magnifying glasses from Oriental Trading. The kids had everything they needed to get digging! 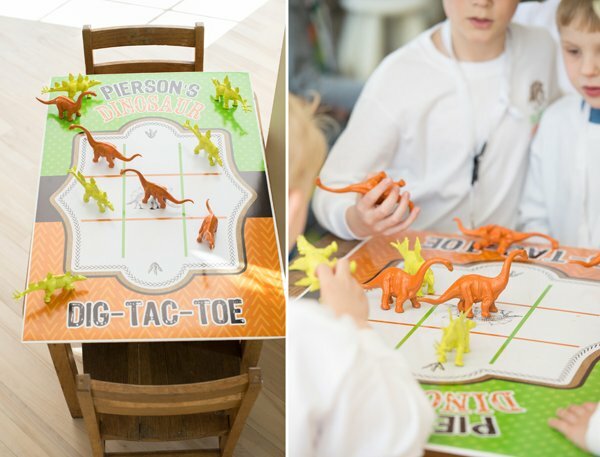 Another hit at the party was our Dinosaur Dig-Tac-Toe … Get it.. Dig? Tac Toe… (Tic-tac-toe)… ok. We designed this game and then spray painted dinosaurs in orange and green as the playing pieces. The kids played the game and didn’t want to stop! Such an oldie but goodie game! The printable Dig Tac Toe game board is available customized in our shop. We had so many little diggers at our party that we had a second room set up. I designed a giant poster for our printable collection that said “Pierson’s Dinosaur Dig” and displayed it over the favor table. Candy Crush Events made a burlap topped tablecloth for our other activity table. It was precious! At that table, the kids enjoyed working on Dinosaur Activity Sheet placemats! 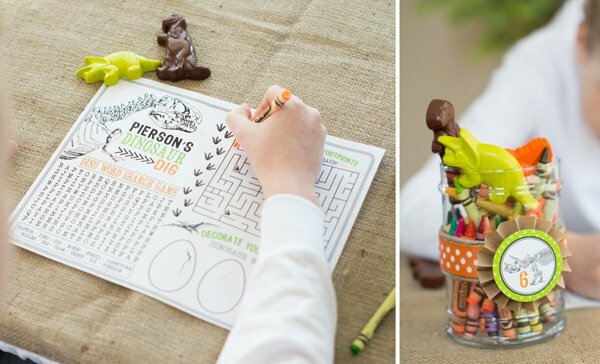 The placemats included a word search, a maze, a dinosaur to color and dinosaur egg decorating. 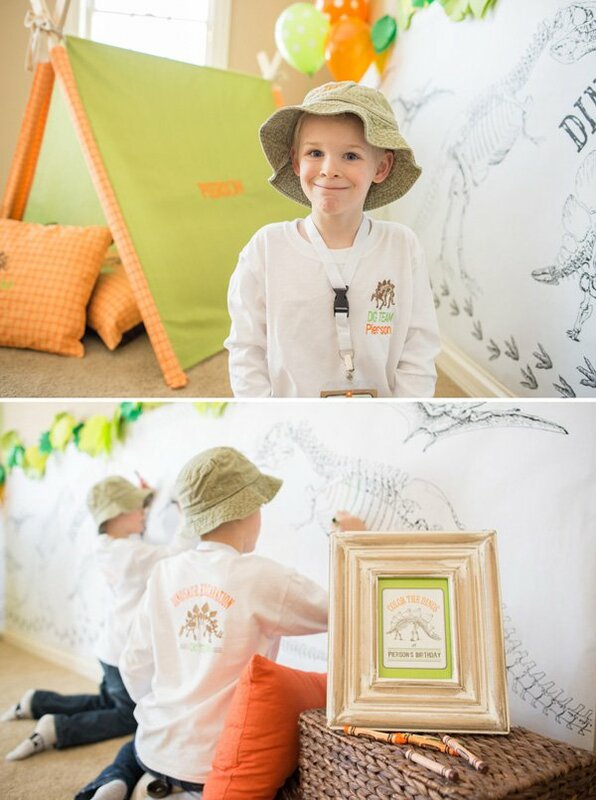 We had another fun activity area set up for the kids that included a Dinosaur Excavator ADORABLE custom tent from Great Stitch. Our little excavators loved hanging out in the tent. It was so precious and had Pierson’s name custom embroidered on the sides. Great Stitch also made custom pillow cases for pillows under the tent. Balloons from Smash Cake Studio were attached at the back of the tent and looked so cute against the large scale dinosaur party printable coloring wall poster. 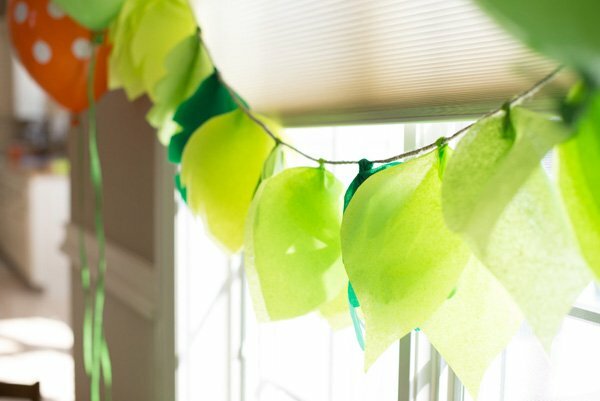 We made tissue paper leaf garland (tutorial coming soon) hanging above for a pop of color. I also had Oriental Trading Company bones hidden all over the basement, so when the kids needed to run around, they went on a Dinosaur Bone hunt. They loved it! I loved how the pop of orange on the wooden dinosaurs turned out! I spray painted 3D Dinosaur Puzzles and it was so simple! The banner from our printable collection was hung on the front of the buffet. One of the favors the kids received was a customized Dinosaur coloring activity book that we added to our Dinosaur Suite of printables. Posh Paper Creations made the most adorable orange and green dinosaur crayons that we included in each bag with the coloring book. The activity book included a cover, connect the dots game page, word search page (with Pierson’s name and six being some of the words they had to find! ), and a page to decorate dinosaur eggs. 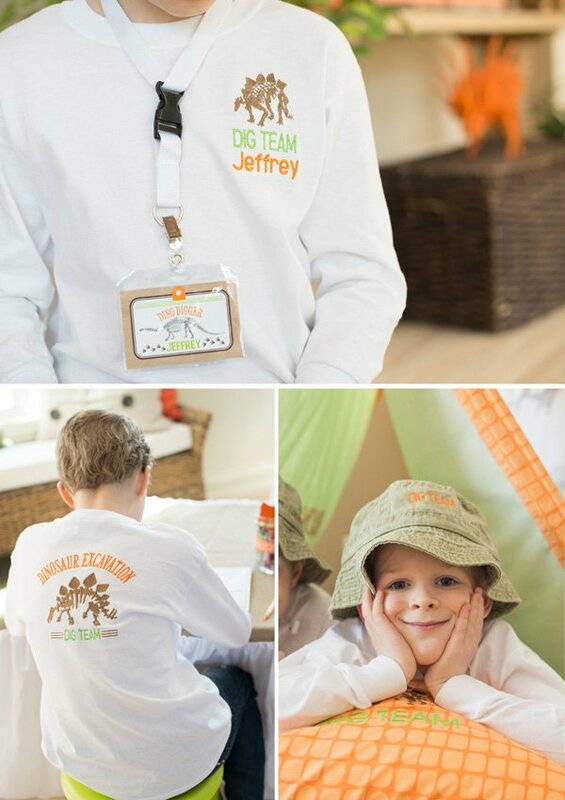 Find all of our NEW Dinosaur Dig Excavation Party Printables in the shop here. Perfection as always. Love the orange + green.